The true origins of the doughnut are unknown. Archaeological evidence suggests they have been around since prehistoric times. According to anthropologist Paul R. Mullins, fossilized remains of fried cakes of dough have appeared in dig sites around the world. In his book, Glazed America: A History of the Doughnut, Dr. Mullin examines our love affair with these tasty treats including their role in history and the ever-changing American culture. The first recorded doughnut recipes show up in the 19th century as variations of the Dutch olykoeks, or oily cakes. The olykoek is a sweet ball of dough, filled with fruit such as apples, raisins, or prunes, and fried n pork fat. The filling helped solve the problem of the olykoeks not cooking all they way through. The now familiar “hole” may have evolved simply to help the cooking process, although there are other ideas on this subject. Legends surrounding the doughnut often involve Elizabeth Gregory and her son, Captain Hanson Crockett Gregory, of New England, circa 1847. Elizabeth was well known for her olykoeks and her recipe included the use of spices and a filling of hazelnuts or walnuts. Some, including Elizabeth Crockett herself, hold that this was the beginning of the term doughnut. Others believe the word evolved from earlier recipes that instructed “little nuts of dough” be placed into hot oil for cooking. Being a good mother, Elizabeth Gregory provided her son with a large supply of doughnuts before he began a long voyage. She also gave a copy of her recipe to the ship’s cook so that he could make more for Captain Gregory and his crew. Legend has it that the Captain improvised a method of holding his snack as he steered through rough seas, by impaling the doughnuts on the ship’s wheel thus creating the first doughnuts with holes. Another version of the story indicates that Hanson Gregory simply didn’t like the nuts and poked them out of the cakes before eating them. Either way, the ship’s cook is reported to have made his doughnuts with the middle punched out using the lid of a round pepper-tin. Captain Gregory is quoted in the Boston Post as creating “The first dough-nut hole ever seen by mortal eyes.” Regardless of its origins, the hole provides that signature doughnut shape. 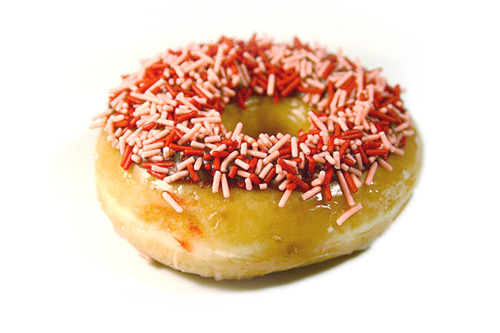 By the early twentieth century, the doughnut was firmly established as an American favorite. They even found their way onto the battlefields of France during the First World War, when members of the Salvation Army provided coffee and doughnuts to American soldiers as a comfortable reminder of home. Donut Day began on June 4, 1938, as a way to thank the volunteers that had served in the First World War and as a fundraiser for the Chicago Salvation Army’s fight against hunger in the Depression Era. Their efforts continue to this day.